Meet The Happy's-A New Interactive Toy Pet Sensation! 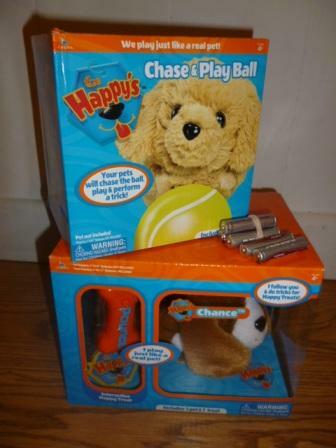 I’d like you to meet the Happy’s-A New Interactive Toy Pet from the creators of Zhu Zhu Pets. This line of 8 adorable pets can do tricks like sit, pounce, spin, and play, just like real pets can do. My daughter asked for new crayons, more coloring books, and an inside pet for her birthday. I WASN’T going to go for a live animal in the house (been there-done that), so I found the next best thing, The Happy’s! Since I was going to give this to my daughter as a birthday gift I pulled it out while she was at school to put the batteries in so it would be ready for instant play when she opened it. I was having a hard time getting it out of the package until I realized it required a small screwdriver to remove it from the cardboard. 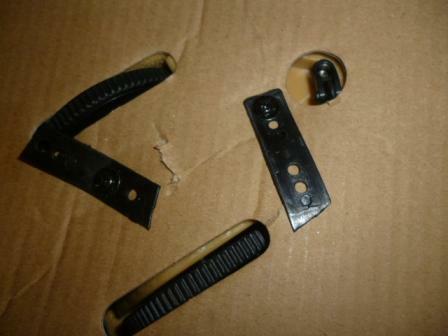 Then it got a whole lot easier when I grabbed the proper tool. The Happy’s work through an infrared signal system, which enables your animal to chase a ball or do a trick for you. For this reason it works better if you don’t play with your pet in bright sunlight. You can tell when the accessories are on because an indicator will light up. Chance came with a “trick” treat that makes him “pounce”. Any treat works with any animal, so the more treats you have the more tricks your animal can do! Each treat enables the pet to do a different trick, such as, wiggle, beg, pounce or chase. I thought the chase ball was a really fun accessory. It takes 3 AAA batteries which are generally not included. It has 3 modes: Gather mode, Trick Mode, and Sleep Mode. In gather mode you get to watch your pet “find” the ball. 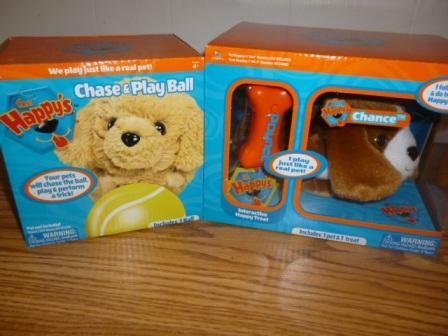 Set the chase ball 8-10 feet away from your pet then turn on the ball. Then turn your pet on. Watch as your pet finds the ball and chases it! When your pet gets close to the ball it will see the trick mode infrared signal and perform tricks-we also have the “pounce” ball. It is fun to watch 1 animal play with the ball, it would be a blast to see several animals going after the ball at one time! When the ball isn’t played with for several minutes it will shut off to save batteries. Here is a quick video of Chance chasing the ball! The Happy’s are hitting store shelves today, April 4th 2014! They are available starting today at Toys R Us, Wal Mart, Target, Justice, and Radio Shack. The makers of The Happy’s have offered to give away one of their new pets to one lucky reader. Entry will be easy to do, just fill out the Rafflecopter form below. This giveaway is open to US only and will end on April 11th at 11:59 pm EST. Winner will be randomly selected and emailed. They will have 24 hours to reply or a new winner will be chosen. Good luck! Congrats to our winner Chattie Hale Hinkle! Chattie, you have been emailed and have 24 hours to reply to that email or a new winner will be chosen. Congrats! Disclosure: Cj from I love my kids blog received the products mentioned above so I could give an honest review to you and compensation. Regardless of our arrangement all the views posted above are my own and are not influenced by compensation. I have 1st grandbaby coming, I would give it to him. I already know ITS A BOY. I would keep this for my niece AnnaLeigh to play with when she comes over. I would give this super fun toy to my daughter, she would love it! I would give this toy to my 3 children! DJ is 10, June is 4, and Joee is 1. Our little girls would have the most fun with it, but big brother DJ would have fun showing them how to work it 🙂 Thanks for the chance! I would give this to my nephew. I think he would absolutely love this! 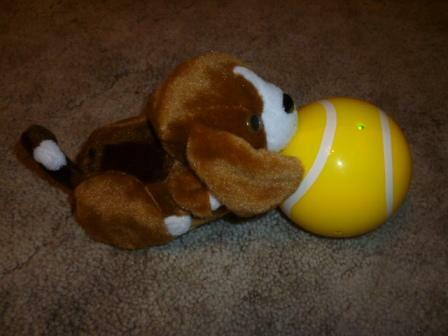 I would like to give this new fun toy to my Granddaughter, she loves doggie. She must be very happy to receive it. I have 3 daughters who would enjoy it! I’d give it to my two year old. I would give it to my two year old daughter. Looks so fun! I would give it to my Granddaughter, she would love Chance the beagle. I would give this to my son. It would be great for his Easter basket! Oh I would give this to my grandson! Oh we would have so much fun with it! My Grandkids would love this – guess they would have to share, LOL! TY4 the chance…. I would give this to my 2 year old granddaughter. My niece who is two loves animals and she will so love this, and love on it like if it’s a real animal. My niece who is two ,loves animals and she will so love this, and love on it like if it’s a real animal. This would be for my daughter who is five. This looks like a toy she would really enjoy. My son would love this “pup pup” ! My son would have a ball with this – and I think our dogs would be amused too! I would give this to my boyfriend’s 3 year old son…he would LOVE it!! I would love to win this for my grandson who has a birthday coming up in May. I would give this toy to my Daughter. Her Birthday is the 20th. She would love this! So would my other 2 kids. I would give it to my grandkids!! How cute! My granddaughter would flip! i would put it up for Christmas. I would give this to my grand daughter, my baby.